Inspired by a previous post, I drove up to the Monument, CO Walmart to look for the new charger. It's in the handicapped parking area right in front of the Walmart store, three spots. There is a SAE Combo and Chademo fast charging station, but it's for pay. There is also a 2-spot J1772 charger, also for pay. 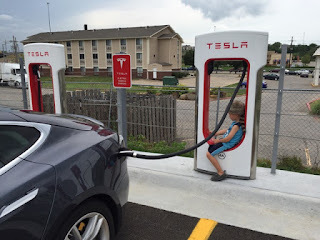 I wonder when the world will standardize on Tesla charging! Our latest new EV owner is Howard S Feldenkreis from Colorado Springs. He has a black 2016 BMW i3 w/REX (range extender). He's our second i3 owner in the club, so I'm anxious to hear about his vehicle. He's made it to Denver and back in his i3, so i'm very interested in his experience. Please make him welcome when you meet him! Our club member, Mark Holzrichter, sent in this photo of three EV-only spots at the Monument, CO Walmart. It appears to be a DC fast charger, like the ones that Nissan dealerships have (CCS Combo / Chademo). Our latest addition, Mehdi Shelhamer, just recently moved back to Colorado Springs, CO. He has a Grey 2014 Tesla S85 and drove across the country last summer in his Tesla. We'll have lots of events in September, so make him welcome! Due to our experience with the Cripple Creek Rally, any group event in the forseeable future will start at the KFC parking lot on 31st Street and W. Colorado Avenue in Manitou Springs. This will give us a clean, easy-on-easy-off location with a traffic light on Highway 24. The instructions for the Pikes Peak Rally has been updated with this information. New favorite Tesla tire place! I couldn't make it to the Evans Ave. Tesla service center for a tire rotation, so I tried my local Discount Tire store at Vickers & Academy Blvd. in Colorado Springs. They never had serviced a Tesla before but turned out to be very good at it. I gave the technician the instruction page from the Tesla manual and then watched him like a hawk. They lifted the car exactly where they were supposed to, found a screw in my tire (causing a slow leak) and fixed it, and rotated the tires. I say give them a try for local Colorado Springs tire work. I've used them with my [somewhat] rare convertible with good results. Oh - if you ever rotate your tires yourself, you have to reset your TPMS sensors using Controls -> Settings (or something like that). Photos of Mt. Evans Hill Climb! Thanks to the Denver Tesla group, the Mt. Evans Hill Climb was a success and they have lots of photos. Look here and here for the photos. I was so impressed with the 3rd Saturday monthly Kars & Koffee in Morrison, CO this morning that I forgot to photograph my car there. Quite a collection of cars, one family brought four exotics. I even saw a rare Willys-Knight sleeve engine car, a very rare vehicle. I will return next month! ...the Model S P90D gets faster. I got this email today, it looks like the Aurora Drive Electric Week event needs some EV ambassadors. I'll be there on Sept. 10, maybe you can too! Please RSVP to Janna directly. Hope your week is going well! I am reaching out to see if you might be able to help me out. I am still in need of a number of vehicles for our ride & drive event (September 10, 10am-2pm) at EcoTech Institute in Aurora for National Drive Electric Week. Currently we have Nissan and some Tesla owners confirmed, but that is it. Last time you sent a shout out to your folks it was a huge help in getting additional EVs. Would you be willing to do it again for this event? We are happy to have any who are willing to let others ride or drive their vehicles and, of course, be EV ambassadors to spread the word about how awesome they are! Please let me know if you are up for it. Greatly appreciate all your help thus far, thank you so much! Feedback from Running with Scissors! This year it will be on September 10th. What do you think? I have included her in this email. Mac and his friend were great too! Manitou Springs hosted a "Running with Scissors" event on Tuesday, Aug. 16. The event dedicated the new mural on the Manitou Arts Center as well as the new Tesla charger. Dennis Korth, Mac McCauley, David McNeil, John Duprey and Wilson Hitchings were at the event. New members, Scott & Claudia Sanders! Our two newest members, Scott & Claudia Sanders, are from Palmer Lake, CO and will be a future 2016 Model S 60D Metallic Blue owner (perhaps ordering in September 2016) as well as having a Model 3 reservation. Our club member Jim Field told Scott about our group, please make them welcome when you see them! 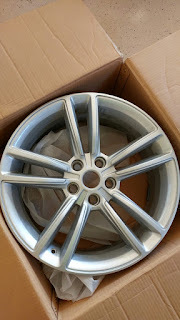 Please contact Heath Smith if you're interested in purchasing any of his three available 19" factory Tesla rims. No tire or TPMS, like new, asking $200 apiece. Cripple Creek EV Rally a success! Twenty-two Teslas and an electric motorcycle made it to the Cripple Creek Rally today. Quite a few locals stopped by for information on the cars and a good time was had by all. Easy purchase of gently owned Teslas! New member, Rexford Haugen, from Thornton, CO! Met a new Tesla owner at the Chenango Car Show!